Mmmmmm! Yes. They. Are. I'm a big fan. Which is funny, because I'm not actually a huge fan of oranges, I mean, they are okay, but not something I reach for often. And the orange flavored jelly beans really aren't my favorite, either, but for some reason, the minute you mix an oragey flavor with creamy goodness, I am in heaven, my friends! HEAVEN! I do so love creamsicles. And creamsicle flavored drinks with alcohol in them. For reals, though... those are awesome. Just sayin'. ANYWAY, when my August kit from Simon Says Stamp arrived at my door, I saw creamsicles as soon as I this stamp set fell into my hands! And what better way to create that refreshing, creamy look, than with watercolors?! Yup. I'm in love. With creamsicles. All over again. 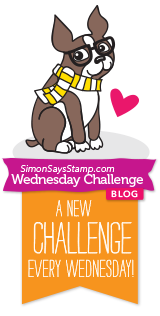 The new Simon Says Stamp Wednesday Challenge, yes, afterall, that is the reason we have gathered together today (Nope, not MAAAWAIGE this time, folks.... or for this thing called life... nope, not that one today, either. Although, now I do really want to listen to Prince all day and watch the Princess Bride. K. Tangent done. Moving forward.). Right. New challenge. It's EMBOSS IT! Yup! We want to see you emboss! You can heat emboss, dry emboss, use embossing paste, WHATEVS, folks! Just EMBOSS IT! I used the super awesome matt dull embossing powder from Wow for my image and then watercolored over it to create a resist. For the textured background, I mixed embossing paste with glitter, because glitter, and then spread it over a stencil to create the dotted background. I kind of love it. Lots. For reals, though. And now it's YOUR TURN! One lucky participant will win a $50 Voucher to the Simon Says Stamp Store! Yup. Dudes. You know you want that. SO, all you need to do is create a NEW project (up to FIVE) with the EMBOSS IT! theme and link it up to the Simon Says Stamp Wednesday Challenge blog! Happy Crafting, folks! You can find the links to the goodies I used to create my card below! Wowsers Jingle - I love this! I haven't had a creamsickle in ages - wonder why they never made them in any other flavors? ANYWAY, I love what you did this week, makes me feel cooler just looking at it! Cool. I didn't even know there was such a thing as dull embossing powder. Glad Lol's enlightened me there - yes, orange Mivvies - my absolute favourite - for reals!! I love reading your blog posts - I giggle all the way through!! Gorgeous card too - I just got my set and am going to play tonight (hopefully) -LOVE IT!!! Love your card and I can't wait to get my kit!! What a fun card! Absolute love everything about it! 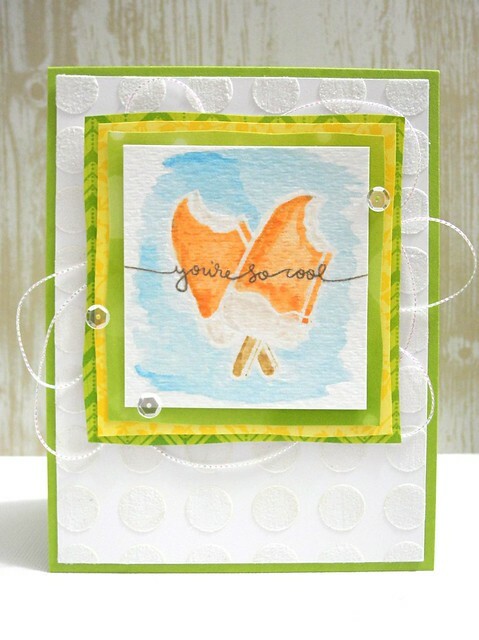 Love Creamsicles and your card looks yummy enough to eat!! Creamsicles and a Princess Bride shout out?! Are you my long lost twin??! Awesome card! And now I want a creamsicle. 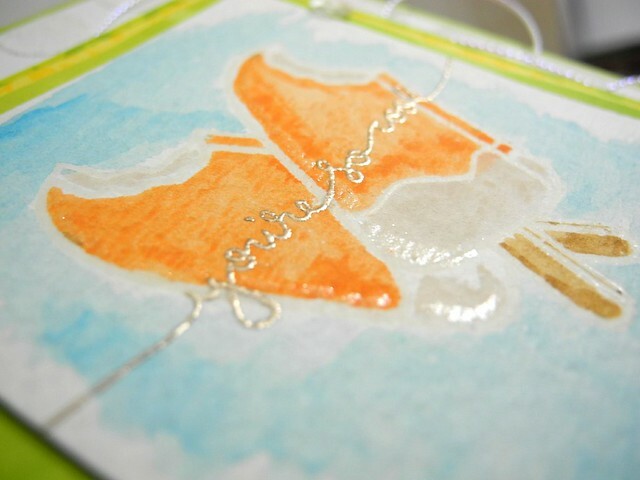 Love this card in watercolors and in creamsicle form! awesome card.. love the watercoloring..
INCONCEIVABLE! Your card is fabulous! & it just so happens that my hubs makes orange sherbet that tastes exactly like an orange creamsicle! YUM! Wow, It is FAB card Jingle!!! Love, lovi it!!! Have a great day. Oh I love this, this just screams summer! Love all the layers and that embossing paste layer, and love the watercoloring! I love all the creamsicles!!! Lol! Drinks...candies...raw (just an orange) anyway! Mmmmmmmm...and your card is awesome! Totally has the creamsicle, yummy, wstercolory feel!! So cool!! And always: because glitter!! A fabulous card Jennifer, I love your design and acidic colour scheme. Your spotted background is fabulous and such beautifully water coloured image!!! This is SWEET!!! Love it! ADORE your water-coloring! Excellent choice of stamps and mediums! The stenciled background is just delicious...LOVE it! Fabulous card hunny, I absolutely love your spotted background. This totally rocks!! 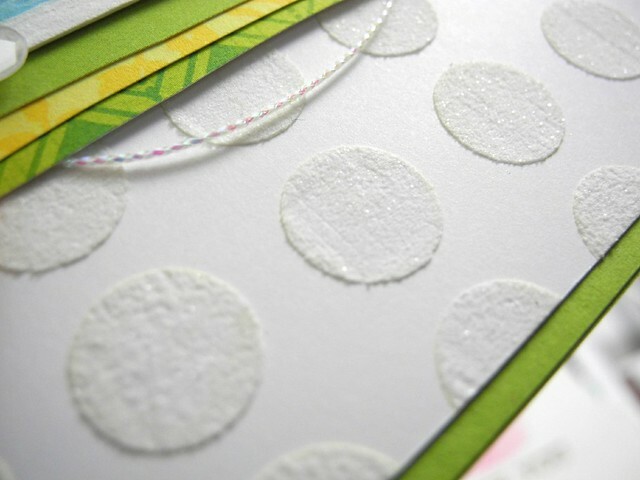 I love the fun embossed circles and the bright colors. Great layering too!! Fabulous card!! MMMM! Love this so much - now I want a creamsicle! I love it, Jennifer, it's gorgeous!!!!!!!! This card makes me hungry! I love the soft colors you created. Just perfect and looks sooo yummy ! hi Jingle! luvin the cool card, so cute...hope you have a fabby weekend! love the yummy texture in the background :) and the soft watercolor... fabulous!! !